Terrence R. Wandtke is an associate professor of literature and media at Judson University in Elgin, Illinois. He is the founder and director of Imago Film Festival. "Robin is caught in an explosion and fans are allowed to call DC (for a small fee) and indicate their preference for him to live or die. While perhaps indicative of a sort of blind devotion to the consumer and making money from Batman as a product, this stunt certainly demonstrates the influence of forces outside those directly responsible for producing superhero narratives, such as editors, writers, artists, etc." The Amazing Transforming Superhero presents a series of essays analysing the changes to various comic book and movie super people, in response to the real world. 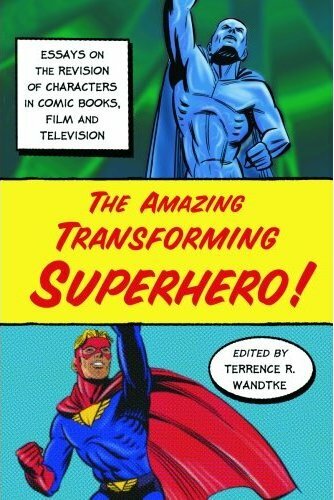 Included are such intriguing diversities as the ultra patriotic, somewhat jingoistic presentation of the original Captain America, Wonder Woman as both a male fantasy and feminist icon, the importance of the Thing's Jewish roots, how Batman became the Man of Tomorrow, and the transcreation of Spiderman from Western to Eastern culture. The essayists themselves are a collection of little known, proficient writers, rounded up by editor Terrence R. Wandtke, an associate professor of literature and media at Judson University in Elgin, Illinois. All of the works attempt to explain how the original image of a hero or heroine has been transformed, over years, in response to local or global politics, changing moral values, social trends, etc. The works range from the Golden and Silver Age of comics, up to the near past with Frank Miller's Dark Knight, and present, including the references to the TV show Smallville and The Incredibles movie. Much of what's here was a little too stuffy and academic for my taste. I often felt as if I were reading a text book. While the writers did, every so often, manage to hint at the soul of their chosen focus, it was usually done in such a fashion as to bleed out the joy. Outsiders looking in, or merely people who are observers not creators? Nevertheless, there are several points of minor interest to the comics fanatic. Some of which, I was pleased to find as an occasional comic book reader of long standing, were new to me. Among them are; Ben Grimm's religious heritage; how Charles Xavier was partly based on Yul Brynner; Superman's rejuvenation via a sexual encounter with Wonder Woman, and the unlikely though jubilant reimaging of Spiderman as Indian teenager Pavitr Prabhakar, complete with dhoti! In summary, this is a book for serious comics enthusiasts who fit into two categories. Younger readers, in need a sourcebook for their own essay or perhaps thesis on superheros, and older well read readers, interested in the dark complexities of the relationships between superhero fantasy, and the nasty intrusion of cold hard reality.